In their latest move to reimagine their roster, the Mariners sent starting pitcher James Paxton to the Yankees. In return, they got three players, including the Yankees' top prospect. Reimagine a Mariners starting rotation without its most talented pitcher going into the 2019 season. As part of general manager Jerry Dipoto’s offseason of change — which he isn’t calling a teardown, build-up or reset but a “reimagining” of the roster — Seattle traded talented but at times enigmatic left-handed pitcher James Paxton to the New York Yankees on Monday for three prospects — left-handed pitcher Justus Sheffield, right-handed pitcher Erik Swanson and outfielder Dom Thompson-Williams. “To add three dynamic athletes who are entering the prime of their respective careers, while also maintaining six seasons of club control for each, is very exciting,” Dipoto said in a statement. In a conference call, Dipoto said the team’s plan was to take a “step back” in 2019 with the roster with a focus for the 2020 and 2021 seasons. “With the hope we can take two steps forward,” he said. That step back could include more trades to remove older players from the roster. Shortstop Jean Segura, who has a no-trade clause in his contract, and reliever Alex Colome could be next. Seattle likely would unload second baseman Dee Gordon and third baseman Kyle Seager if given the opportunity. Dipoto reiterated that closer Edwin Diaz, left-handed starter Marco Gonzales and outfielder Mitch Haniger aren’t priorities to be traded but aren’t untouchable. 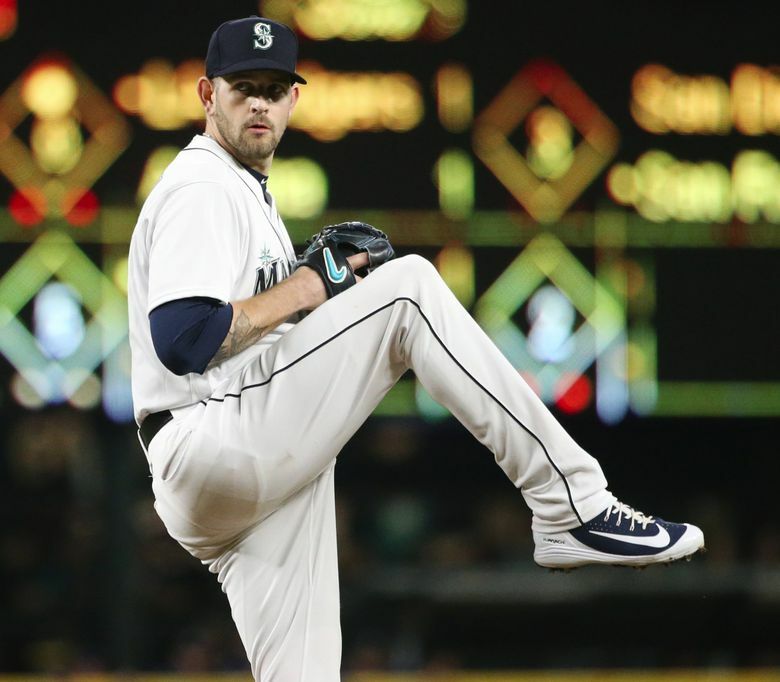 Sources said early in the offseason that trading Paxton, who had two years of arbitration eligibility remaining before free agency, would be a priority for the Mariners in an effort to capitalize on a weak starting-pitching market and infuse some younger talent into the organization. The Yankees had been looking for a starting pitcher to fill out their rotation and settled on Paxton instead of going through free agency. Paxton, 30, started 28 games in 2018, posting an 11-6 record and a 3.76 ERA (67 earned runs, 160.1 innings) with 208 strikeouts and 42 walks. He ranked ninth in the American League in strikeouts, and among AL pitchers with at least 160 innings he was third in strikeouts per nine innings (11.68), fourth in strikeout-to-walk ratio (4.95), seventh in WHIP (1.10/42 BB, 134 H, 160.1 IP) and ninth in opponents’ average against (.224/134 for 598). He had two stints on the disabled list for back spasms and a left-forearm contusion. “It seems to me that Seattle is trying to go young right now and kind of building for the future, and so my window I guess is only for the next two years,” Paxton said on a conference call. “I think they are going young. That being said, my experience in Seattle has been fantastic. Everybody has treated me so well and they really groomed me and taught me a lot. I worked with some great managers, some great coaches and great teammates. Of the three prospects acquired, Sheffield is the most highly regarded. He was considered the Yankees’ No. 1 prospect in their organization by Baseball America, MLB.com and Fangraphs. Sheffield, 22, spent most of 2018 with Class AAA Scranton Wilkes-Barre, where he posted a 6-4 record with a 2.56 ERA (25 ER, 88.0 IP) with 84 strikeouts and 36 walks in 15 starts and five relief appearances. He also made five starts with Class AA Trenton, going 1-2 with a 2.25 ERA (7 ER, 28.0 IP) with 39 strikeouts and 14 walks. He made his major-league debut Sept. 19 against the Red Sox, pitching 2 2/3 innings and allowing three runs. There have been questions about Sheffield’s pitch efficiency and ability to throw enough strikes to match his quality stuff, which includes a mid-90s fastball. But those were also similar criticisms of Paxton when he was Sheffield’s age and trying to break into the big leagues. The Mariners believe Sheffield profiles as a front-of-rotation starter similar to Paxton. Sheffield and Swanson will enter spring training to compete for a spot in the rotation. If Sheffield makes the opening-day roster, he would join right-handers Felix Hernandez and Mike Leake and lefties Marco Gonzales and Wade LeBlanc in the rotation. Swanson, 25, was rated the No. 22 prospect in the Yankees organization by MLB.com. He split the 2018 season between Trenton and Scranton/Wilkes-Barre, posting a combined 8-2 record with a 2.58 ERA (33 ER, 115.0 IP) in 20 starts and two relief appearances. He averaged 10.41 strikeouts per nine innings (133 SO, 115.0 IP) while limiting opponents to a .204 (85 for 416) batting average. Most scouts believe he profiles as a end-of-the-rotation starter or a swing reliever with the ability to pitch multiple innings. “Erik Swanson has performed at every level, combining a mid-90s fastball as well as two effective secondary pitches,” Dipoto said in the statement. “At 25 years old, he is just entering the prime years of his career, and we think he will impact our Major League club in the near future. Thompson-Williams, 23, spent most of 2018 with High-A Tampa, hitting .290 (96 for 331) with 56 runs, 16 doubles, four triples, 17 home runs, 65 RBI and 17 stolen bases in 90 games. A left-handed-hitting outfielder, he’s never played above High-A and was a fifth-round draft choice in 2016. This is Dipoto’s second major move of the offseason, having traded catcher Mike Zunino to the Rays for outfielder Mallex Smith and outfield prospect Jake Fraley. Seattle Times reporter Bob Condotta contributed to this report.